The African Christian Health Association (ACHA) family planning programme was implemented in Uganda and Kenya by two members: Christian Health Association of Kenya (CHAK) and Uganda Protestant Medical Board (UPMB) with funding from the David and Lucile Packard Foundation. This programme sought to utilize the faith communities to improve contraceptive uptake. The program was implemented by building the capacity of CHAK and UPMB to provide FP services, increasing information, education, and communication (IEC) to religious leaders and by them, and also involving other key community stakeholders in the process, such as health facility administrators. 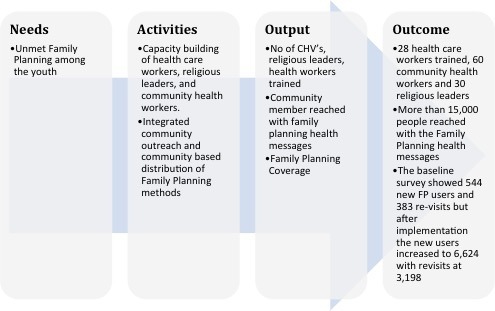 This program aimed to create a replicable model for strengthening Family Planning within Christian Health Association’s (CHA’s) in other sub-Saharan countries. The Family Planning programme was piloted in 2013 in four health facilities, two in Kenya and two in Uganda. Two strategies were applied: Capacity building of health workers, religious leaders and community health workers through on job training, on-site mentorship, and performance tracking mentorship, and experience sharing forums. In both countries, a baseline survey was conducted. At the community level there were community integrated outreach services, community based distribution of family planning methods, creation of awareness and education by religious leaders and community health workers. Ministry of Health family planning cards and registers were used to collect data on referral and uptake of family planning services. Both quantitative and qualitative data collection methods were used. At baseline questionnaires for health workers and focused group discussions were used to: assess level of knowledge on use of Family Planning methods, Family Planning practices and the different family planning methods available. Training and mentorship was done to project officers from both countries on project tracking performance indicators. The religious leaders and community health workers met monthly to give feedback at the facility. The programme officers coordinating the activities at the regions would review and validate the data and send the community and health facility data to CHAK for consumption and feedback to the health facilities. Quarterly supervision was done by CHAK and UPMB to the supported health facilities to address the challenges and improve the quality of Family planning services. New clients preferring long acting and reversible methods like IUCD and Implants. Use of condoms also picked up as a dual protective method. Erratic supply of family planning commodities and high staff turnover in the health facilities was identified as a challenge. 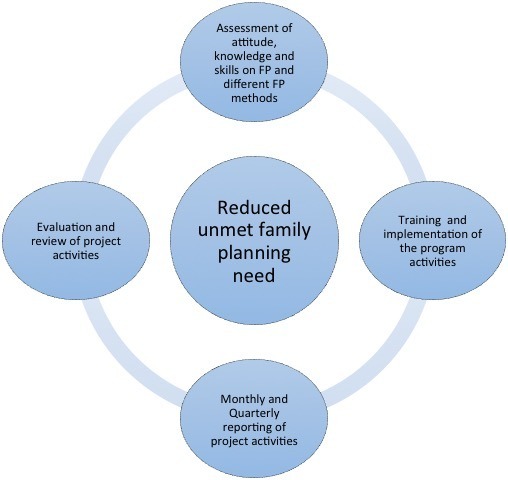 Scale up involvement, engagement and empowerment of men in family planning. Address reproductive health concerns as couples rather than individual. Give feedback to the implementing facilities and communities to improve on programming.